"This is quite possibly the one thing that I am constantly asked to make. 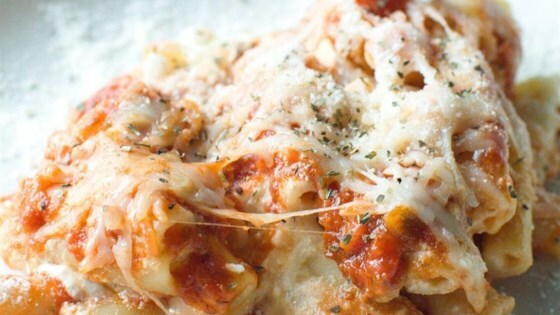 This is a ziti with a lot of flavor." Preheat an oven to 350 degrees F (175 degrees C). Grease a 9x13 inch baking dish. Fill a large pot with lightly salted water and bring to a rolling boil over high heat. Once the water is boiling, stir in the ziti, and return to a boil. Cook the pasta uncovered, stirring occasionally, until the pasta has cooked through, but is still firm to the bite, about 8 minutes. Drain well in a colander set in the sink. While pasta is cooking, heat a large skillet over medium heat. Add the sausage, and cook and stir until brown, about 10 minutes. Drain sausage and set aside. Stir together the ricotta, egg, onion, garlic, and oregano in a large bowl until well combined. Stir in the drained pasta, the drained sausage, salt, pepper, and 1/2 jar of the spaghetti sauce; mix well. In the prepared baking dish, cover the bottom with 1/3 jar of spaghetti sauce. Layer 1/2 of the pasta mixture, 1/3 jar of spaghetti sauce, and 1/2 of the shredded cheese. Then layer the remaining 1/2 of the pasta, 1/3 of the sauce, and 1/2 of the cheese. Sprinkle with basil. Cover the dish tightly with aluminum foil. Bake in the preheated oven until heated through, about 20 minutes. Uncover; return to the oven and bake until cheese is melted, 5 to 10 more minutes. I make a similar recipe, minus the ricotta. I use hot Italian sausage instead of the mild for a little kick. This is an excellent dish for a busy day, easy to put together and bake. This recipe and it's contents is wonderful. A bit more Italian Sausage is needed for our taste. Great recipe! This recipe was delicious! My husband had a few friends over when I made this and I barely had any leftovers! I will definitely make this again - recipe needs no changes. GREAT MEAL WITH GARLIC BREAD.